Irene Kim is one of the top models in South Korea, but elsewhere around the world, she’s on top of the list of every designer’s front row seats. With her signature rainbow-colored hairstyle, she rocks any kind of outfit with her modelesque looks, bubbly personality, and amazing confidence. And yes, she went to the Tory Burch runway show with a pajama-inspired ensemble and she still looked like a million bucks! Bryan Boy hails from Manila and he’s been doing the fashion rounds for years, even before the slew of millennial bloggers came into the scene. This season, he’s upping the ante with his fur-trimmed print and camel Prada coat and changed it up with a more sleek, cleaner look as he watched the shows. Expect California-born South Korean vlogger and style star Aimee Song to always bring her A-game when it comes to her OOTDs. This season, she keeps things interesting by wearing monotone looks and bright colors paired with covetable accessories like hand-held bags, booties, and sunnies (that are probably not even on the shelves yet). Hot mom Chriselle Lim is keeping it chic and comfy in her power suits and chic coats as she makes a minimum of three changes per day! This Korean-American redefines what it means to be a multi-hyphenated empowered woman: she’s a fashion stylist, lifestyle and beauty blogger, digital influencer, and founder of The Chriselle Factor, and she now owns her own creative company! Same as Bryan Boy, Kim Cam Jones also hails from Manila and has caught the eyes of major designers and editors with her sophisticated styles. Even though she started off as a TV lifestyle show host and commercial model, she heeded her passion for fashion and is now a content creator for her own website. This season, she’s rocking a new cropped ‘do which we predict will have every woman wanting freshly cut uneven bangs. Another cool mom and fashion week staple is Eva Chen, former editor of Lucky and Teen Vogue, who’s renowned for her digital savvy and impressive social media following. She now works for Instagram as head of fashion partnerships. What makes her feed and Insta stories different is that her posts are always so relatable as she balances her work and two kids (who are just as savvy and adorable as she is). This season she brought out her designer coats (check out how she layered one over the other!) to beat out the tail end of NY’s winter cold. Tina Leung is never afraid to get bright and bold, starting off with her platinum blonde hair. 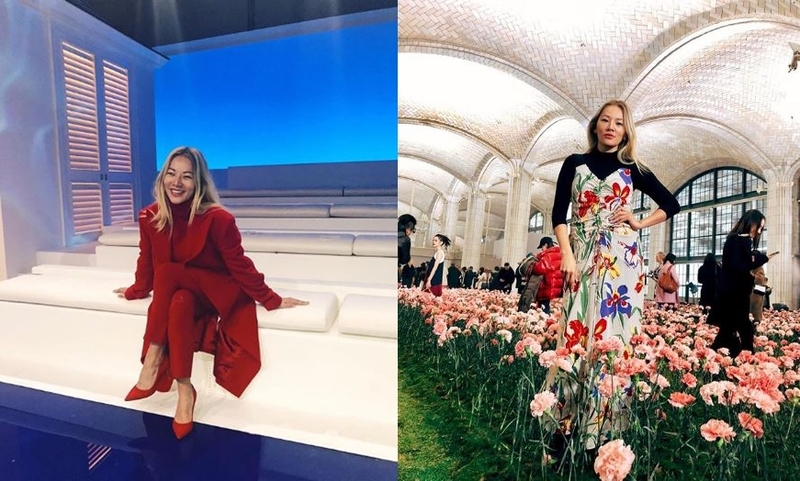 She wore a head-to-toe red Ralph Lauren suit and matched the lovely blooming scenery at the Tory Burch show with a floral dress.